and it´s fixed for him, so I hope you can help me too. So i have the standard Origin edition of C&C 3 KW and Windows 10. 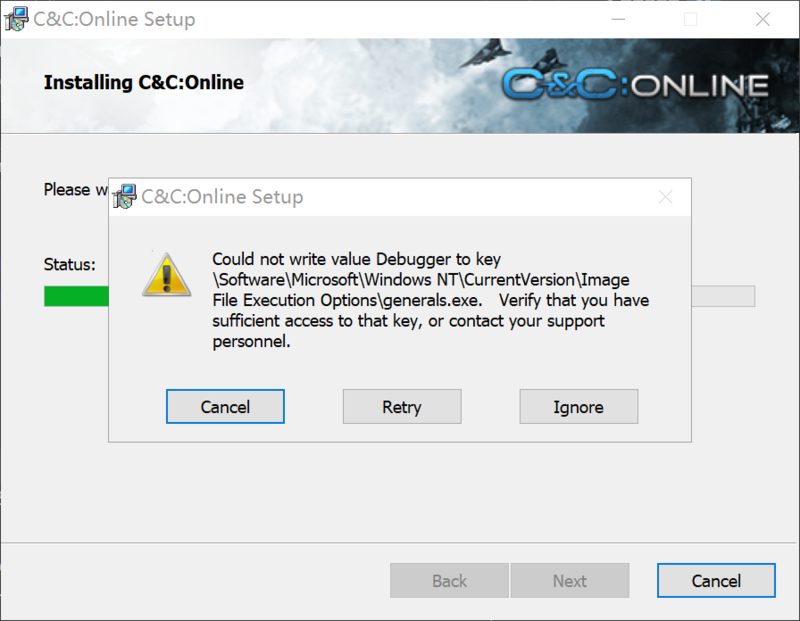 The problem comes when i try to install the C&C online setup and the error Could not write value Debugger to key \Software\Microsoft\WindowsNT\CurrentVersion\ImageFileExecutionOptions\generals.exe Verify that you have sufficient access to that key, or contact your support personnel. tried following the normal procedure for this error (i disabled the antivirus and ran the file as admin) but i wasn't successful. So i tried to actually give the permission by editing my regedit but i failed again. If skipped the problem will occur several times and then the installation will proceed as usual, but when i try to hook the game, it doesn't work. I read other threads about this problem and i guess the solution might be that magical version of the launcher i heard about. I tried the same things as he and have still the same Problems. Furthermore when I am in the Game and click on "Online" my game freezes for approximately 5 minutes before throwing up an error : "Cannot Connect unable to establish a connection with Kane's wrath servers, please check you inter connection." (PLEASE NOTE: It still opens the menu as if i could log in but won't let me do anything but press "OKAY" and go back to main menu (FlamingoeZ had that problem too and hooking helped). I think I've figured out the issue after testing again... If you launch kanes wrath before C & C online this will happen. AND if C&C online is not hooked to kanes wrath it will also cause this issue. I recommend anyone who has this issue should make sure that they have hooked their games properly! If that still don't work. Try to disable it and try again. @Edvin2090 Thank you for your answer, I really appreciate that, but I already did "tried following the normal procedure for this error (i disabled the antivirus and ran the file as admin) but i wasn't successful.". At PanzerJäger´s Topic you can see that there is already a solution for this problem (https://forums.revor...key/?hl=+hook). I apparently need the "magic client". Edited by Unreal_9er, 09 April 2019 - 08:02 PM. Edited by lwahg, 19 April 2019 - 05:57 PM.